Arsenal take on Sporting in their first European match at home since match day one of the Europa League. 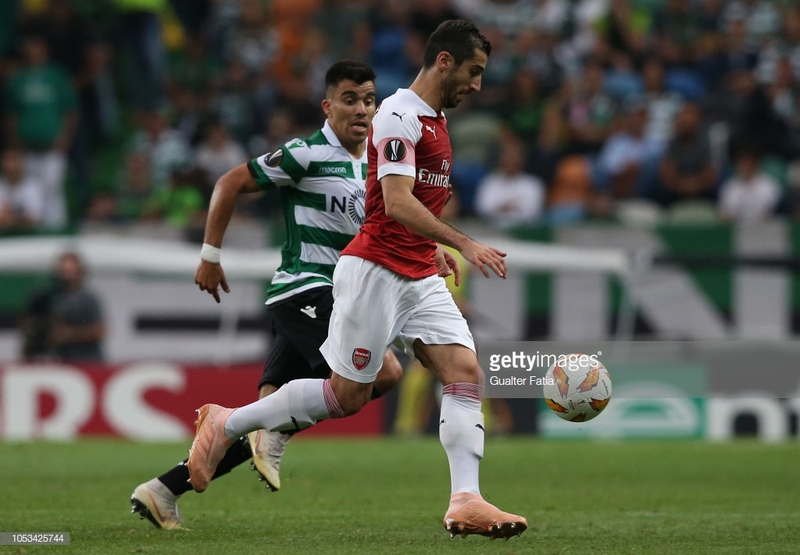 Arsenal take on Sporting CP on Thursday evening with the knowledge that a win will seal their place in the knock-out stages of the Europa League. The Gunners have been in fine form this season with a top-four place in the Premier League looking a real possibility. However, Unai Emery's men can secure a Champions League place by winning this competition - something they failed to do last term when a defeat to Atletico Madrid over two legs denied them a spot in the final. Arsenal came through their toughest match of group E last time out, when they won for the first ever time on Portuguese soil, defeating Sporting 1-0. That away trip could have been a stumbling block with Sporting having not been defeated at home in 14 months. However, the Gunners came away with the win that put them in control of their group. A win for Sporting on Thursday would open things up at the top again but if Arsenal were to be victorious at the Emirates they'd secure a place in the knock-out stages. Barring their trip to Lisbon, Arsenal have found their European journey quite straightforward so far. On matchday one they defeated Vorskla 4-2 in a comfortable display, before sealing a 3-0 win over Qarabag in Azerbaijan on matchday two. Sporting on the other hand also beat Vorskla and Qarabag but looked rather toothless when they took on Arsenal for the first time. If they're to get anything from the game then they'll have to be far better in attacking areas. Danny Welbeck was the man who scored the vital goal in Portugal last time out and he has been a key part in the Gunners Europa League campaign so far, scoring twice in three matches. However, the forward could be on his way out of Arsenal in the not too distant future. His contract is up at the end of the season and reports in the build-up to this match suggest Crystal Palace could be about to make a move for him. The 27-year-old has proved able deputy to both Alexandre Lacazette and Pierre-Emerick Aubameyang this season, but all three have featured at some stage in this season's Europa League. It remains to be seen whether either Lacazette or Aubameyang will start on Thursday night but Welbeck is a certainty to feature. Petr Cech is likely to start in goal with Bernd Leno retaining his Premier League place since the former's return from injury. Matteo Guendouzi was sent off in Arsenal's Carabao Cup win over Blackpool last week but should be in contention to start this week. Other youngsters Emile Smith Rowe and Ainsley Maitland-Niles may also feature in some capacity. Mohamed Elneny is injured, whilst Sokratis and Nacho Monreal are still being assessed ahead of the tie. Laurent Koscielny and Konstantinos Mavropanos are both out. Emery has favoured a degree of rotation in this competition so expect players such as Hector Bellerin and Mesut Ozil to be among the substitutes. Sporting have a host of injury doubts and will likely to travel to London without some major players. Rodrigo Battaglia came off after half an hour of Sporting's match with Santa Clara at the weekend. Abdoulaye Diaby was also injured in that game. There are also problems with three other players; Raphinha, Stefano Sturaro and Stefan Ristovski are doubts but they do at least have Bas Dost back who missed the reverse fixture with Arsenal. Arsenal predicted XI: Cech, Lichtsteiner, Mustafi, Holding, Kolasinac, Guendouzi, Ramsey, Welbeck, Mkhitaryan, Iwobi, Aubameyang. Sporting predicted XI: Ribeiro, Gaspar, Coates, Mathieu, Acuna, Gudelj, Petrovic, Nani, Fernandes, Cabral, Dost. Alex Iwobi's rejuvenation since Emery's arrival in North London over the summer has been sensational. The Nigerian was a hugely frustrating player last season under Arsene Wenger but has been fantastic so far this term. He is likely to start this Thursday and could prove to be the main difference maker for Arsenal. His direct play and running ability has been a joy to watch in game's he's featured in this season and the wide man is showing great potential. His battle against Bruno Gaspar who is expected to start at right-back for Sporting will be one to watch with intrigue if Iwobi plays on the left. Another key battle will be Arsenal's centre-back pairing against Dost. The Dutch striker missed the fixture in Sporting and as a result, Fredy Montero started as the main forward. He offered little to nothing for his side but Dost will provide a completely different challenge. He is a robust and physical player who will be a menace for the defence and one the likes of Shkodran Mustafi and Rob Holding will have to be wary off if the Gunners are to secure their passage through the group stages. Emery: "It's a good result but we know it's going to be very difficult there"